For today's post I've got some pumpkin spiced caramel corn from Aldi. 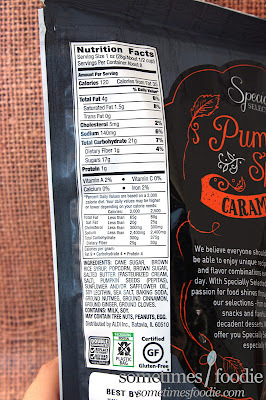 To be honest I wasn't too keen on buying this, because I thought it was going to be another novelty pumpkin spice product that no one wanted to eat that would clutter up my kitchen cabinets, but it proved me wrong. The packaging for this product is actually pretty nice. We have some nice food imagery, some Trader Joe's-esque looking illustrations, hand written-looking text, and a some faux texturing. Not bad for an Aldi product, right? It's pretty snazzy, and on top of looking nice, the bag is easy to read and resealable. So it's functional to boot! Aldi's design team, especially the one who release their seasonal products, have really stepping up their game! 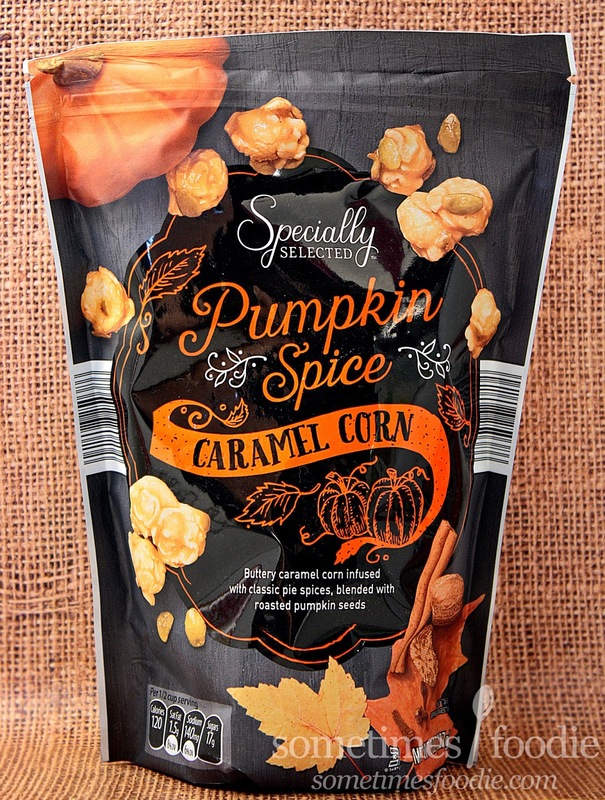 Once you've opened the bag, and gotten past the resealable plastic closure, the caramel corn inside is a light amber color, much lighter than I expected it to be, and it smells sweet, buttery and a little bit spiced. I expected this to be a seasonal punch in the face, like some of the pumpkin spiced Archer Farms products that were out this year, but this is a much more subtle pumpkin spiced aroma. Let me tell you, after a few years of reviewing pumpkin and pumpkin spiced products, I have come to appreciate the ones that go with a more subtle approach. Sometimes less is more, and this product proves that to be true. I popped a few pieces into my mouth and I was hooked. 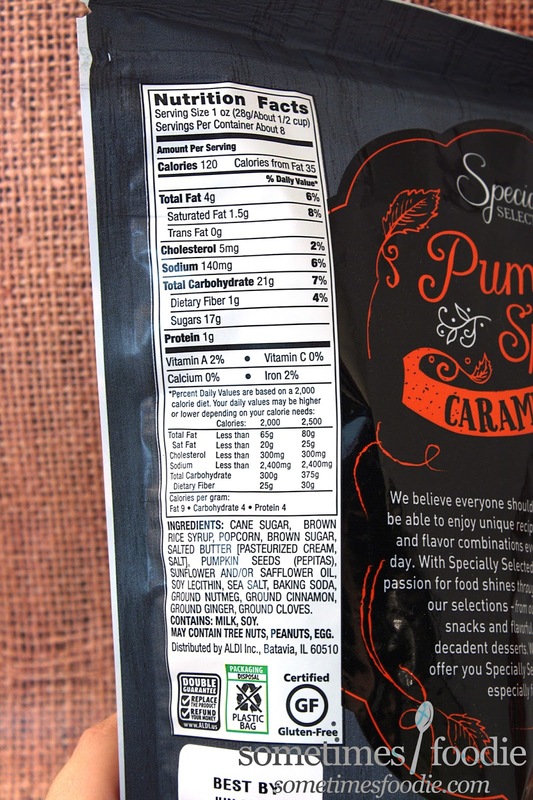 The caramel coating is thin, giving each piece a delicate crunch with a light, buttery, caramel flavor, leaving you with a mild pumpkin pie spice flavoring at the end that is just bold enough to be evocative of the pumpkin pie spices, without being overly obnoxious or cloying. 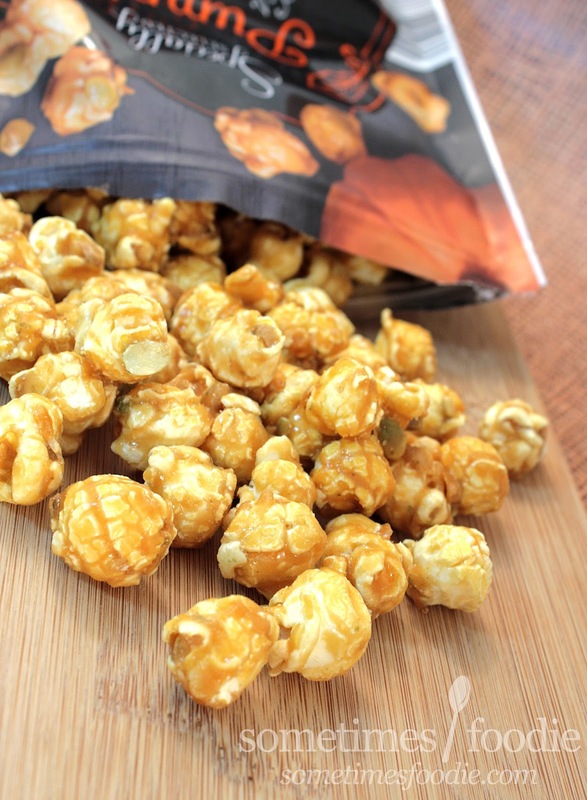 The end result is a highly addictive caramel corn that is crispy, light, and absolutely irresistible. This stuff really wowed me. I thought it was going to be another fall product I only bothered buying because I run this blog, but I ended up really enjoying it. I brought this bag to work with me, to do some desk-snacking, and I nearly finished the entire bag. If you see this at your local Aldi on clearance, do yourself a favor and scoop up a bag. I'm really hoping this one makes a comeback next season, because I'd love to grab a few to give out as seasonal holiday gifts. Like Sometimes Foodie's Facebook page to keep up with all my foodie adventures! That sounds divine! Why not peppermint caramel corn?! They could mix some of the chocolate covered mint flavored popcorn to give it some pop.